Buy Firewire Surfboards Online - Kitemana! The world famous surf brand Firewire has been making performance-oriented surfboards for years. Besides surfing legend Kelly Slater, the boards are also appreciated by other Pro surfers for their cornering, precision and speed. After the worldwide success in the surfing world, it is our turn. Firewire now has a number of awesome models of kiteboards in the range. These boards were once designed for wave surfing, but fully tuned for the kiter so that upwind kiting is a breeze and the boards are sturdy enough to endure jumps. Firewire works with the best boardshapers out there, including Daniel Thomson, Dan Mann, Nev Hyman and Jon Pyzel. In addition to these shapers, the brand works closely with kite / surfers all over the world to link feedback directly back into the design. The most popular Firewire Kiteboards are the FST Tomo kiteboards. FST stands for Futures Shapes Technology, which means an extra strong construction method. The Firewire FST surfboards have a Balsa wooden rail, in combination with a high density aerospace composite top and bottom layer. As a result, the Firewire kiteboard retains its fine flex properties, but still has a very solid basis. A balsa wooden rail also ensures that you have less chance of dings and other damage. Finally, FST provides a balanced kite surfboard with the ratio between flex, weight and durability. The latest technology from Firewire is Helium technology. This is a new construction with super light blank so that the board is not normally light anymore. This makes it super easy to make airs and freestyle tricks with the new Firewire helium boards. 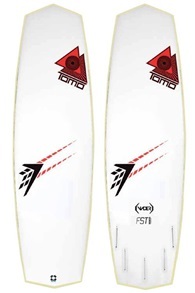 The Firewire Tomo kiteboards are shaped by Daniel Thomson and all have a modern shape design. What is particularly striking about the design of the Tomo kiteboards is that the nose has been left out on most boards. This immediately results in a lighter, more compact design. In addition, the Tomo boards have heavy channels so that you have more grip on the water during kiting. This helps you carving and promotes water flow under the board. This gives the boards more control on the water surface and they are wonderfully stable. 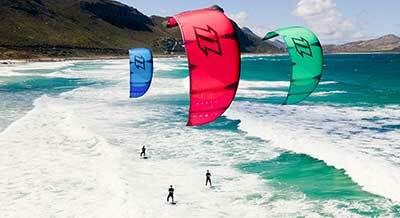 This kiteboard is wonderfully all-round and in fact every kiter can handle this. 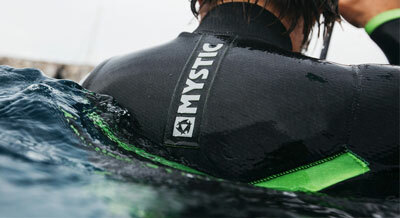 The Evo feels nice and stable, but also ensures a wonderful carve session in the waves. His rail is sharp enough to cut through the water. 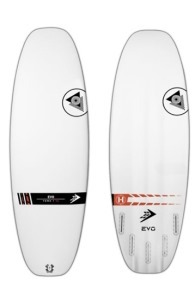 The Firewire Evo FST is planning very early thanks to its straight outline and somewhat concave. This enekel concave runs to the tail and slowly flows into a quad channel, for a nice grip and to kick him nicely on his tail. Sail the Evo as small as possible, because he already has some volume of himself. That way he keeps feeling nice and playful. The Firewire Father is incredibly fast and has a skate feeling with a wonderful speed. Its asymmetrical design gives you the space to easily make small jumps and shoots fast against the wind. A tough surfboard for the demanding kiter. This Firewire Father comes with 5 fin design. This means that you can sail this Father with 4 or 3 fins! Every one's own preference, but alternating is also super nice.